The Division of IT provides high-speed wireless network connection for use by faculty, staff, and students in education, research, and administration. 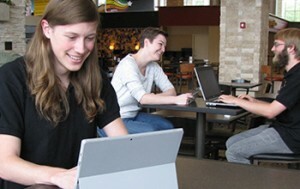 The wireless network is accessible in most campus buildings. The Division of IT provides wireless connections accessible from most campus buildings. Authenticated network access using your MU ID (username) and password. Secure information transmission via advanced encryption methods. The ability to print to network printers without using VPN. A guest network is also available for short-term use by university guests with a department sponsor. Please note: Unauthorized access points (those not installed, maintained, and managed by the Division of IT) are prohibited by MU's business policy 5:085. This policy was implemented in order to facilitate a common, campus-wide standard for wireless networking that will be available to all legitimate users. When an unauthorized access point is identified, the owner will be asked to remove it from the network. The TigerWiFi-Guest network is designed and operated for the benefit of university guests and visiting scholars (with a department sponsor) who need short-term access to wireless. It is not designed to handle a large number of users or to provide high levels of availability. Long-term university guests should obtain a username in order to use the wireless network for the duration of their visit. Once configured, your wireless device should automatically connect when TigerWiFi is in range. If it does not, you can select the wireless network from your list of available wireless networks. See Getting Started tab for more information. There are multiple technology standards for wireless networking. The campus standard is 802.11g/n/ac. See the KnowledgeBase for instructions on configuring TigerWiFi on your computer, phone, or tablet. Or visit the walk-up service desk on the lower level of The Mizzou Store for personal assistance. The Guest network is available for short-term use by university guests with a department sponsor. A WPA2-PSK key is required to connect to this network. Please contact the sponsoring department's IT Pro to obtain the WPA2-PSK key. The key is changed regularly. Long-term university guests should obtain a username in order to use the wireless network for the duration of their visit. Contact the sponsoring department's IT Pro to request a 30-day guest username for non-university-affiliated persons. The wireless coverage level is provided as funded by the requestor. The Division of IT does not have control over the wireless frequencies for off-campus locations and cannot resolve frequency conflicts caused by other wireless networks or devices that use the same unlicensed frequencies in surrounding buildings, including but not limited to microwave ovens and some cordless phones. Unauthorized wireless devices, routers, switches and/or hubs cannot be connected to MU's wired or wireless networks. Subscribing Greek houses that do not choose to follow the policies required by the Division of IT are subject to having the service removed. Alternate wireless solutions, if utilized, cannot connect to the MU network and must have a completely separate Internet connection. If you have questions about wireless connectivity, request a consultation with Division of IT staff and choose the "Wireless LAN for Greek Houses" option.